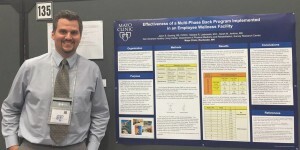 DAHLC Health & Wellness Coach, Jason Soyring, presented a poster entitled, "Effectiveness of a Multi-Phase Back Program Implemented in an Employee Wellness Facility," at the American College of Sports Medicine 62nd Annual Meeting in San Diego, CA, on May 26-30, 2015. Various studies support the theory that muscle weakness and imbalance, leading to a Functional Movement Screen (FMS) score of 14 or less, leads to an increase in injury risk. In this study, participation in an 8-week comprehensive low back fitness program improved FMS scores in a significant number of individuals, with over one third of the group moving to a level of lowered injury risk.